The Cargo Classic rack from Tubus is the company's original rack and has over the years become a bit of a classic. And for good reason: it's a solid rack that is really easy to fit and is compatible with most frames on the market. There are loads of racks on the market to suit different requirements. If you want one that can take a heavy load, the Cargo is rated up to a whopping 40kg, plenty for a couple of stuffed panniers and a tent on top. Despite its load capacity, it's impressively light. The Cargo Classic is handmade in Germany from tubular chromoly steel and is very well finished in a tough epoxy powder coating. Fitting to the frame couldn't be any easier; from box to riding took me all of five minutes. The two adjustable struts are easy to install compared to any other rack I've ever used, and they provide a good range of adjustment so you can get the rack perfectly set up in the right position. All bolts are supplied as well. Riding with a pair of Ortlieb panniers mounted to the rack showed there to be no clearance issues; the rack is set back far enough that your heels are well clear of interfering with the bags. Even with heavily loaded bags, the rack is impressively sturdy. It doesn't budge over rough roads and cheerfully handles you heading off-road too. The rear plate has several holes drilled in for easily mounting a reflector or LED light. 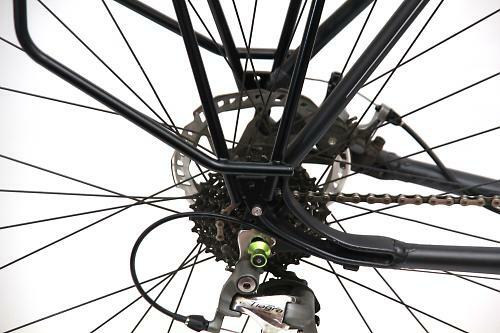 There are loads of accessories available for the rack including a pump holder, seatstay mounting kits, spacer discs and quick release axle adapters. For short tours and multi-day continent hopping epics, the Cargo Classic is a rack capable of taking the heavy loads and does so with a reassuringly solid ability. 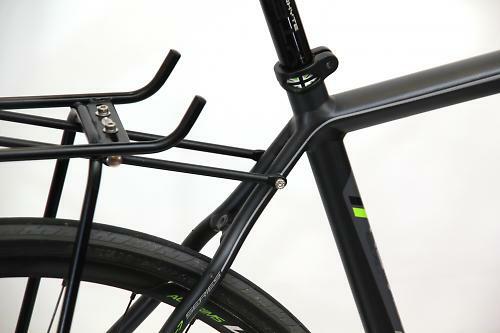 That it is easy to fit to most frames is an advantage, and the adjustable arms make it a cinch to fit as well. Tubus offer a 30 year warranty and a worldwide free of charge replacement service during the first three years for registered customers, which isn't something to be sniffed at, and makes this expensive rack good value for money. Without doubt, this is the sort of rack that will last a lifetime. As well as the 700c version, it's also available for 26in bicycles. Our classic - your favourite since 1988.
models. The CARGO is our all around carrier. routine check-ups tested by its owners. Really solidly constructed, it feels bombproof. Easy to fit and securely holds loaded panniers in place. It's a solid construction, and the 30 year warranty, with a free replacement offer in the first three years, is appealing and a nice backup. There are lighter, but considering the 40kg maximum load capacity, it's light for the load it can carry. It's pricey compared to some other racks, but comes with a 30 year warranty which adds value. It's really easy to fit and very adjustable. 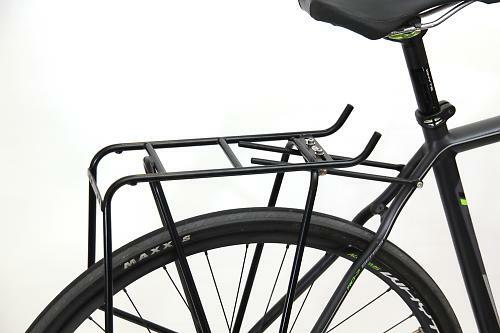 A really nicely made rack ideal for everything from popping to the supermarket to riding across Europe. Definitely the stiffest rack I've ever owned. Perfectly rigid and stable, even at high speeds. On the other hand there is a problem with corrosion, like with any steel rack. I sold my own Cargo because of that - I simply didn't have time for maintenance, the paint was wearing off even though I was using protective stickers. They just didn't last long enough which was quite a pain for me. After some time, while using another rack (XLC RP-R11 - amazing value!) I found a solution to that problem: I simply wrap the tubes of a rack with an old bicycle tube. An added advantage is that the panniers make much less noise on rough roads now. Who knows, maybe if I found this solution sooner, they would make my life with Tubus much easier?